Items per quantity: Pack of 25 tags. 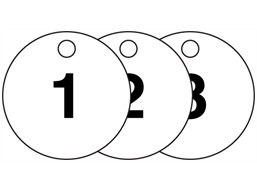 Plastic valve tags. Set numbered 1-25. 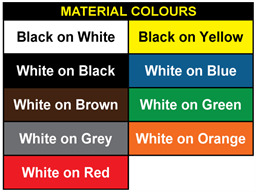 Available in 9 colour combinations and 2 sizes. Plastic valve tags. Set numbered 1-25. 1.5mm thick engraving laminate with 1 fixing hole. Available in 9 colour combinations. VTA01 Size 27mm diameter (with 3.3mm diameter fixing hole. Material engraving laminate. Traffolyte (traffolite). VTB01 Size 38mm diameter (with 5mm diameter fixing hole. Material engraving laminate. Traffolyte (traffolite).